Over the years I’ve had a few casual waistcoats made. What makes them casual? Well primarily cloth, ideally something with a pronounced texture and perhaps a chunky pattern – in this case, a tan/black herringbone woven from a wool/linen mix. I also prefer such waistcoats with as few pockets as possible. Sometimes two, but even none – as shown here. 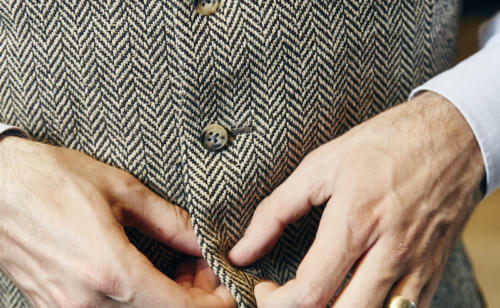 To someone used to a dress waistcoat, the absence of pockets might seem a little jarring, but this deliberate choice moves the waistcoat a little closer to being knitwear – to a sleeveless cardigan, which again I’d usually prefer to be pocket-less. Another nice, casual element is the extension of a band of the cloth around the back of the neck, as you can see below. It intrudes onto the sheen of the lining and breaks it up, suggesting the collar of a jacket. Indeed, I started thinking about this waistcoat recently when I wore it to a fitting for my button-in gilet with Davide Taub (pictured, head cutter at Gieves & Hawkes). 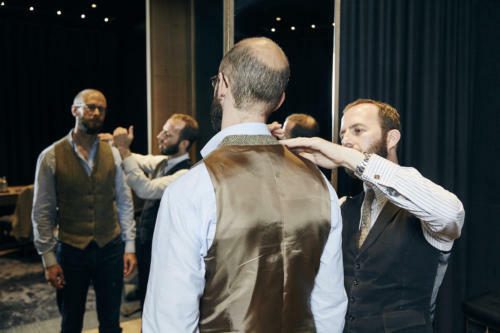 Davide reminded me how high the waistcoat had been cut on the neck, up around the shirt collar. A regular dress waistcoat would never be cut like this because it risks pushing out the collar of the jacket. 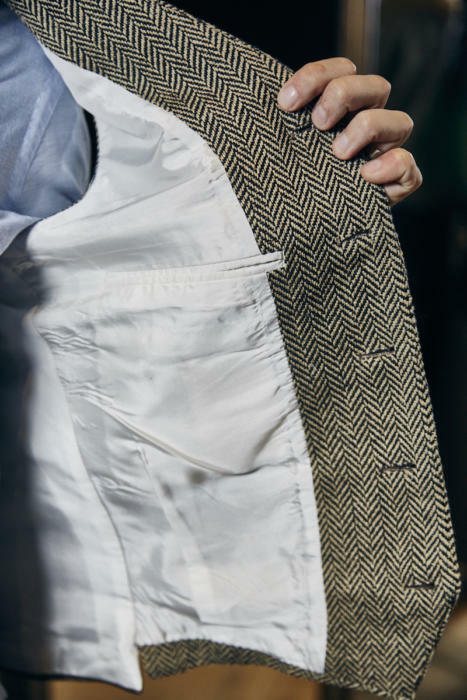 The waistcoat – cut by Russell Howarth at Graham Browne, several years ago – was also quite high under the armholes, again unlike a normal dress piece. It was nice to be reminded of these points, which I discussed with Russell at the time. The only thing I would change about this waistcoat now is the back – which I would have in a cotton twill or similar matte-finish material. The Bemberg is simply too shiny for a casual piece. A casual waistcoat always involves a trade-off in length. Any waistcoat will look best with high-waisted trousers, where it can be shorter and only extend a little below the natural waist. If it is worn with low-waisted trousers, the waistcoat must be longer to prevent shirt peeking out. But too long, and it loses all proportion. Part of the solution is to have relatively high-waisted jeans or other casual trousers (I normally wear these with my high-waisted bespoke denim from Levi’s Lot No.1). Another is not to have too big an opening at the front or sides of the waistcoat. Oh, and the waistcoats always have in-breast pockets. Only works in heavier cloths. You can follow the discussion on The casual waistcoat: preppy herringbone by entering your email address in the box below. You will then receive an email every time a new comment is added. These will also contain a link to a page where you can stop the alerts, and remove all of your related data from the site. Do you think that cloth choice would work for a full-on three piece suit? Appreciate it may not be to everyone’s taste but I’ve been considering a tweed / herringbone three piece for some time as I like the slightly cod-Victorian vibe it gives off. I’ve got a couple of old moleskin waistcoats from Tim Everest (20+ yrs now – he was at Princelet street then). They both have moleskin backs, are a bit longer than normal (I wear my trousers very low-rise), one has a jacket collar the other does not. Without doubt they have been the most worn bespoke items in my wardrobe. Down to pence per wear now. I really like this style! Good contrast between trousers and waistcoat in color and same degree of pattern/roughness of material. But one great thing that stands out for me is how the shirt frames your face in first picture. Together with the waistcoat you have two nice Vs. Does a shirt have a higher neck button down collar with wider collar? What kind of jacket would you choose on top (maybe even coat)? Does waistcoat have to made bespoke or can MTM be applied? Are alternations possible on RTW waistcoat? That’s interesting you say that because I have considered a MTM waistcoat for my bespoke suit commission. Thinking, it’s under a jacket, will still fit well in theory, and won’t actually be worn that often, being used more as a 2 piece. Of course I’m thinking this for the cost saving. About £400 as thom Sweeney. I may have to re evaluate this. I also meant to say that it is fantastic to see a great jeans outfit. I seem to live in knitwear and short as a uniform once Autumn hits so an outfit like this would be a nice change of pace. Love the cut, pocket-less finish and interior pocket. Another winner from Davide. I know you generally dislike shiny backs on a waistcoat, I wondered whether there was a matte-look material that would be smooth in finish, that could be part of the design? 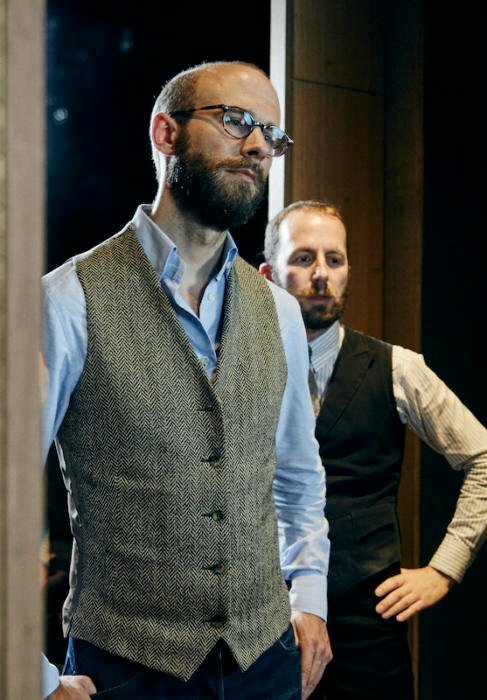 On the subject, whilst not bespoke can I reccomend Smartwool’s range of vests (Corbett 120). I bought one last year and it is one of the few gilets that will fit under a tailored jacket. The rear is a panel of Merino wool cloth, whilst the front is nylon faced but filled with a thin wool insulation. Excellent warmth for colder days when an overcoat is not yet needed. A waistcoat’s the closest-fitting of all tailored garments. 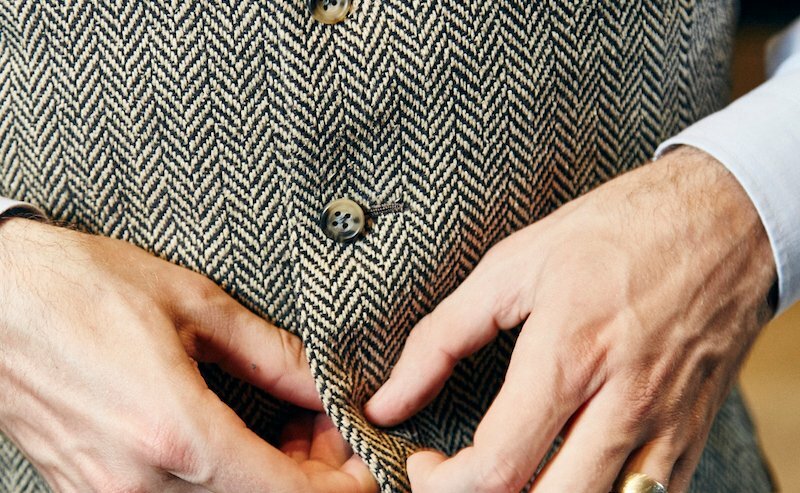 Putting a pocket on the inside is pretty unusual (and tricky to access). A mobile phone will show through and a normal-sized wallet is unthinkable. Outside pockets make more sense, hence that tradition. No easy solution if you don’t want outside pockets. Maybe you need a waist-jacket! But outside waistcoat pockets were never intended to hold mobile phones; they were not in existence. Coins, tickets and the like perhaps. Simon – what shirt are you wearing here? I do like the collar stand in the photo at the top of the post. Thanks! Mmmm, are you sure? 🙂 I don’t see it mentioned, nor a link, unless I’m really missing something…..! But thanks for the reply. Is this a particularly tall collar on this shirt or just a function of how it stands with the waistcoat? Thanks! Perhaps, in for example a Harris tweed – something with some texture. I generally find my mid- to light-grey waistcoats have been more useful, but it does mean they can’t be worn with grey trousers.